Does Manual Handling Training Reduce Risk of Injury? Home » News » Does Manual Handling Training Reduce Risk of Injury? Comments Off on Does Manual Handling Training Reduce Risk of Injury? I spoke to a guy a month ago who had just learned that the excruciating pain and suffering he was experiencing in his back and legs over the past number of months was down to a slipped disc (prolapsed/herniated disc). He is an engineer who lifts heavy tools into and out of a machine on a daily basis. The activity requires lifting, reaching, stooping and bending while supporting a heavy load as it is being secured into place. I asked what his employer had done to reduce the risk of injury and got the answer I expected “We were provided with manual handling training”, I proceeded to ask if the training covered the risk assessment process and if he was advised how to asses the risk with the view to coming up with solutions to eliminate or reduce the need to lift and if the lifting part of the course coverd lifting activities that were specific to his job. He answered “No, the trainer just covered the law, injury, something about tiles and then we were shown how to lift an empty box off the floor”. The training did not reflect the activities carried out at work on a daily basis and staff were not advised how to asses risks and identify if an activity has the potential to cause harm to the employee, particularly to the back. This type of training has very little benefit to the employer or the employees and is most likely not worth doing. When you are considering training make sure you speak to the trainer and assess his/her knowledge. They should have experience in the risk assessment process, their training should be based around risk assessment and prevention of injuries. The advice they should be giving is that you must consider the principle of prevention as the first step in the management of manual handling. A good instructor will arrive early and assess the activities of employees so he/she can make the training specific to them and advise employees when they should say “this activity is too risky for me, I need help”. A good instructor will teach lifting techniques that are specific to the activities the employee carries out on a day to day basis. Unfortunately most manual handling courses just cover the law, injury and lifting the empty box. This is why the stats have not changed over the last 20 years, with back injuries accounting for about a third of all work related injuries. HSA guidance on manual handling training indicates that training should cover law related to manual handling, anatomy, injury, risk assessment, control measures (principle of prevention) and lifting techniques that are specific to activities employees are involved in. If your training does not cover the above, it is most likely not worth doing, save your money for the insurance claim or get a suitable trainer and carry out your risk assessments. Armed with the knowledge of risk assessment and principles of prevention, the guy (with the back injury) went to his employer and advised that they should be avoiding the need to lift (where possible), to his surprise the employer bought into the Idea of avoidance of risk and injury prevention, and installed a Pillar Jib Crane. 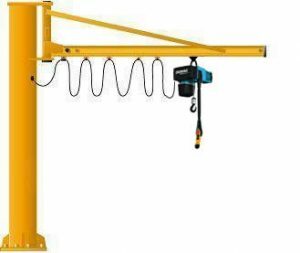 They documented the manual holding procedures and trained staff specifically in the use of the crane and the handling of the tools. They worked out that using the crane would improve the efficiency of the job saving approximately 1.5 hours a week on just one machine. This might not sound like much of a saving when you work out the hourly rate of the employee (€16), however when you look at how much the employee makes the company in an hour (€150 on average) that works out at about €7500 a year in extra revenue with very little risk of injury. 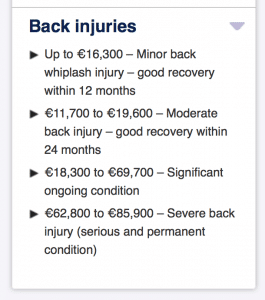 If you considered the cost of a back injury claim (see below from PIAB), it is a no brainer. Risk assessment and avoidance of risk is the cheapest way to manage your manual handling. Do not use a trainer because they are cheap, use a trainer because they are good and can help protect both the employee and employer. All trainers should be qualified to QQI level 6 or equivalent(According to HSA) in manual handling training. If you are interested in becoming a trainer give us a call. We run instructor courses every month, we train instructors to be the best at what they do. All our instructors have the opportunity to come back to us on a weekly basis and sit with experienced trainers on public courses, as many times as they wish until they have enough experience to deliver their own training.